Members of the U.S. Women's National Team say they know they are on the "right side" of fighting for equal pay with their new lawsuit that blasts soccer's national governing body for allegedly paying mere "lip service" to gender equality and dishing out markedly more pay to the men's team. "We know in our hearts, and we know with the facts that we have, that we’re on the right side of this," Megan Rapinoe, a star forward for the team, said Monday on "Good Morning America." "I don't think anyone can argue that there's gender inequities in this world, that there’s a pay gap, that there's pay discrepancies." Rapinoe and her teammates on the world champion U.S. Women's National Team (USWNT) sued the United States Soccer Federation (USSF) Friday for gender discrimination. The lawsuit comes just three months before Team USA -- the winningest team in women's World Cup history -- prepares to defend its title at the FIFA World Cup in France. 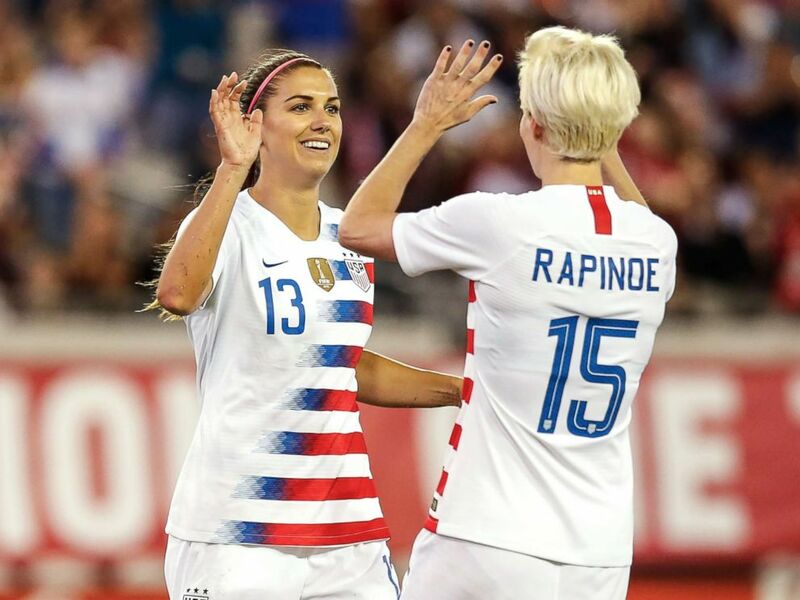 Rapinoe and her teammate Alex Morgan, also a forward, said they have no plans to boycott the World Cup while the lawsuit plays out in court. "I don't think it's ever been in our minds to step off the field," Morgan said. "We've been looking forward to the World Cup for three years now ... We want to continue to play for our country at the highest stage this summer in France." 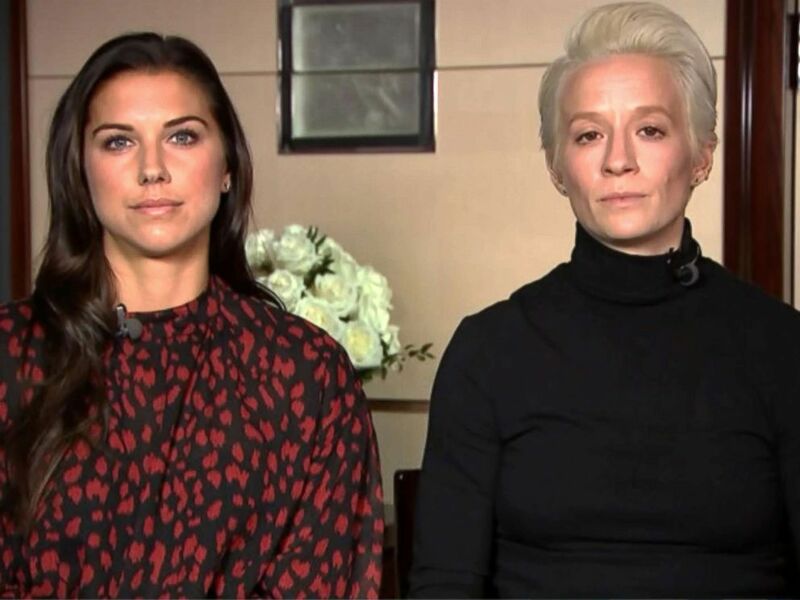 Alex Morgan and Megan Rapinoe appear on "Good Morning America," March 11, 2019. The lawsuit, filed in California federal court on International Women's Day, cites not just pay, but also the denial of "at least equal playing, training, and travel conditions; equal promotion of their games; equal support and development for their games; and other terms and conditions of employment." "In reality, the USSF has utterly failed to promote gender equality," the lawsuit reads. "It has stubbornly refused to treat its female employees who are members of the [women's national team] equally to its male employees who are members of the [men's national team]." The USSF, the lawsuit claims, "has paid only lip service to gender equality and continues to practice gender-based discrimination against its champion female employees on the WNT in comparison to its less successful male employees on the MNT." The suit says that female players earned $15,000 for "being asked to try out for the World Cup team and making the team roster" in 2013 through 2016. On the other hand, men earned $55,000 each for making the World Cup team in 2014. To critics who argue the U.S. men's team brings in more revenue and so should be compensated more, Rapinoe and Morgan said those claims are "arbitrary." "Obviously [pay equity] is the hot button issue but in order to have I think a fair and a balanced conversation around compensation, we need to look at everything," Rapinoe said. "We need to look at the way the youth teams are funded. We need to look at the way our staff -- our coaching staff, our medical staff -- is funded. We need to look at promotion and branding and marketing and sponsorship, all of that." U.S.team soccer at the women's friendly football match between France and USA at Oceane stadium in Le Havre, France, on Jan.19, 2019. "Until we do, until we have equity and equality of the men's and women's team on both those sides, we can't really say, 'Oh, the men make this and the women make this,'" she added. Morgan pointed out that the 2015 Women's World Cup final was the "most-watched U.S. soccer game in history." "So I think those claims are really arbitrary," she said of the revenue comparison. The U.S. men's soccer team did not qualify for the 2018 FIFA World Cup. Their best finish was third place -- in 1930. The U.S. women's team, on the other hand, has won the World Cup three times -- in 1991, 1999 and 2015 -- and the gold medal at the Olympics four times, most recently in 2012. The 28 members of the 2015 winning team are all named as plaintiffs and the suit requests class action status to represent players who have been on the team since February of that year. The suit seeks back pay including interest and benefits, damages, attorneys' fees and other relief. 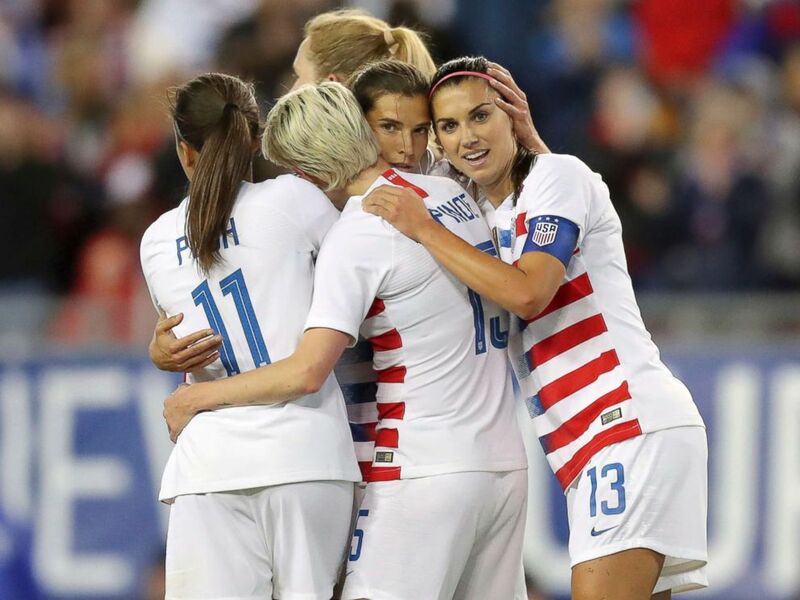 United States' Tobin Heath, second from right, is congratulated on her goal by Mallory Pugh (11), Megan Rapinoe and Alex Morgan (13) during the first half of a SheBelieves Cup soccer match against Brazil, March 5, 2019, in Tampa, Fla. 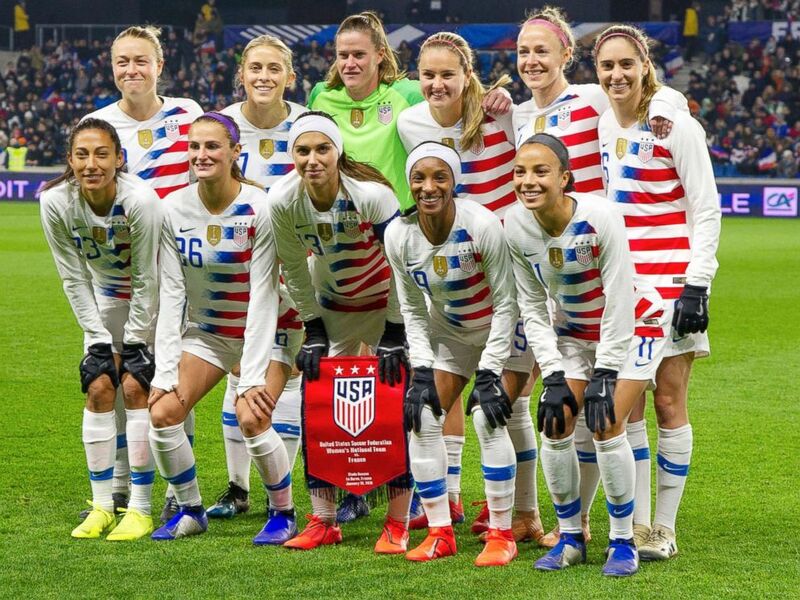 In 2017, the women's team reached an agreement with the USSF after filing a complaint with the United States Equal Employment Opportunity Commission over pay. The agreement included direct and bonus pay increases and per diems equal to the men's team, according to ESPNW, as well as improved travel and financial support for pregnant or adopting players. It also included required improvements in National Women's Soccer League standards. In February, the EEOC issued the soccer players a "right to sue," the new lawsuit indicates, which is required to sue for discrimination under federal law. U.S. Soccer released a statement Monday pointing out that the U.S. Women's National Team reached a collective bargaining agreement with the organization two years ago. The USWNT is not the only women's team fighting for equal pay and conditions. The women's national hockey team has been on its own mission, following the soccer team and spurred by its victory at the 2018 Winter Olympics. Similarly, professional female athletes in tennis and basketball have also been making calls for equal pay, prize money, conditions and infrastructure. Rapinoe said she hopes the USWNT's lawsuit sends a message to women to "fight for what you believe in." "The big picture ultimately is just giving that message that you should fight for what you believe in. You should fight for what you feel you earn and never give up," she said, acknowledging that the fight is "difficult at times." Alex Morgan and Megan Rapinoe celebrate a goal during the International Friendly match between the U.S. and Mexico in Jacksonville, Fla., April 5, 2018. "For us, it's not only about leaving our sport in a better place, leaving it better for the young girls that will come after, but just in general, inspiring women around the world to stand up for what they believe in," Rapinoe said. "They have an ally in us. We are with them. we support them and we will continue this fight as long as we need to." Morgan spoke about the support the USWNT has felt in their fight, including from the U.S. men's team. "The men have also come out and said that they are in support of us as well, and so we respect them so much for that," she said. "It's great to see that support from them, from a lot of our sponsors as well, from women all around the world, both inside and outside of the sport." "You know that you're doing something right when you gain that support from people around you to help lift you up," Morgan added.